Adelaide Trailer Hire offers a wide range of 8×5 Tipper Trailers for local and interstate use. Our range of rental trailers includes: 6×4 Box Trailers, 6×4 Caged Trailers, 7×5 Caged Trailers, 8×5 Box Trailers, 8×5 Caged Trailers, 8×6 Box Trailers, 8×6 Caged Trailers, 10×6 Caged Trailers, 8×5 Enclosed Trailers, Furniture Trailers, Motorbike Trailers, Hydraulic Tipper Trailers, Car Trailers, Flatbed Trailers, Camper Trailers, VMS Trailer Signs and Trailer Equipment & Accessories. Today’s blog post is a shout out to all our tradie customers. We know you work hard, your jobs are physical and sometimes it feels like you just can’t get the manpower you need to help you do jobs that little bit easier…that’s exactly why here at Adelaide Trailer Hire we’ve added hydraulic tipper trailers to our fleet. This trailer is the kind of mate you’ve always wished for – does the heavy lifting, doesn’t complain…and never tries to pinch your snickers bar when you’re not looking. Essentially, a hydraulic tipper trailer is a trailer with a hydraulic ram that lifts with a button that is operated by a battery. Hydraulic tipper trailers are perfect for transporting anything that you want to slide out and dump – dirt, pavers, tiles, cement bags, landfill and rubbish, to name just a few. Their main benefit when compared with a truck with this function is that they are smaller and so they can be used with a regular vehicle. This means that when you have large or heavy loads that can be tipped out at their destination, your job can be reduced by not having to manually unload. Our hydraulic tipper trailers are 8 x 5 and rated to carry 1200kg. As with all our hire fleet, they come with round trailer plugs, jockey wheels, spare tyres and, if needed, flat adapters and D shackles. We’re always amazed here at Adelaide Trailer Hire at the many uses that our trailers are put to and we have no doubt this will also be the case with our new fleet of hydraulic tipper trailers. As an example, we recently met a great guy, Gavin, who was setting up his own lawn mowing business. Gavin had his shiny new website, business cards and even a few customers who were starting to feel like regulars. Then he got the call that all new business owners want and dread in equal measure…someone wanted him to take on a huge job, the kind of job that would make the business…the only problem was, Gavin was going to need to move a lot of dirt in a tight access area..
With a bit of budgeting Gavin purchased what he needed, but that was the end of his funds for expansion. So how was he going to get into this tight access area? That’s where we came in. Gavin came in one day and had a chat to us and hired a hydraulic tipper trailer from us for three months, taking advantage of our long-term hire rates, and giving himself time to rake in the big bucks so he could purchase his own trailer in the future. The hydraulic tipper trailer meant he could load and unload the soil without needing a second set of hands and without risking damage to the work site. As always, we’re here to discuss your needs with you. If you’re not sure if a hydraulic tipper trailer is what you need, come in and chat with us. We’ll be able to work out load limits and safety requirements to help you get your job done quickly and safely. The 8×5 Tipper Trailer is perfect for domestic and light commercial use. Rated to carry 1200kg, the trailer is commonly used for green waste, hard rubbish, dirt and mulch. Interstate Trailer Hire, Fire Wood Trailer Hire, Gardening Trailer Hire, Rubbish Removal Trailer Hire, Green Waste Trailer Hire, Sand and Dirt Trailer Hire, Bricks and Pavers Trailer Hire. NOT INCLUDED WITH TRAILER HIRE: Tie downs, ropes, jack or wheel brace. Click here for Adelaide Trailer Hire’s Terms & Conditions of Hire. 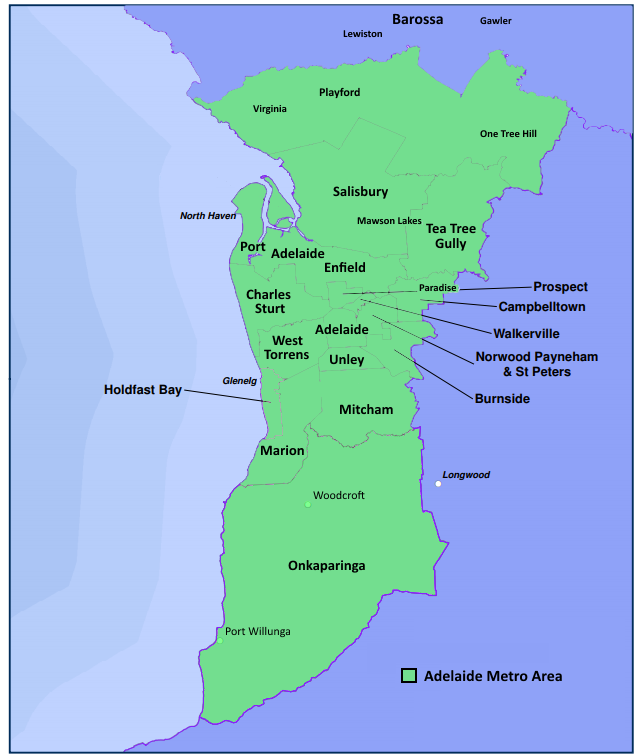 Trailer Hire distance fees apply when leaving the Adelaide Metro Area. This ensures our trailers are well maintained for state-wide and interstate use. Adelaide Trailer Hire offers a wide range of rental trailers for local and interstate trailer hire. 6×4 Box Trailers, 6×4 Caged Trailers, 7×5 Caged Trailers, 8×5 Box Trailers, 8×5 Caged Trailers, 8×6 Box Trailers, 8×6 Caged Trailers, 10×6 Caged Trailers, 8×5 Enclosed Trailers, Furniture Trailers, Motorbike Trailers, Hydraulic Tipper Trailers, Car Trailers, Flatbed Trailers, Camper Trailers, VMS Trailer Signs and Trailer Equipment & Accessories. We offer great discounts for Camping Trailer Hire, Easter Camping Trailer Hire and Australia Day Long Weekend Trailer Hire. All interstate trailer hires must be returned to Adelaide. Adelaide Trailer Hire offers great long term trailer hire rates. Have a chat to us and hired a hydraulic tipper trailer from us for three months, taking advantage of our long-term hire rates, and giving himself time to rake in the big bucks so he could purchase his own trailer in the future.